Strong Bearing Strength Greenhouse--- This greenhouse has 17lbs Max Weight Capacity of every shelf. 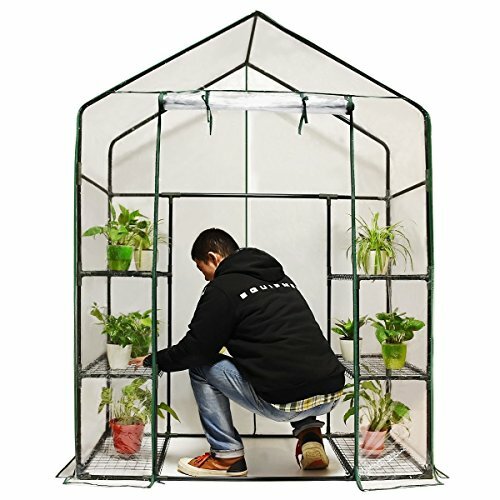 Heavy duty durable powder coated steel framework of the greenhouse makes you never worry about its weight capacity,longer life to use. Top shelf is more suitable for taller plants. One Year Warranty--- Within the Warranty Period, the replacement for any defective part of this greenhouse will be supplied free of charge. Quictent greenhouse has been in fashion for years;we provide excellent after-sale service for this greenhouse, please rest assured to buy! Ships the same day and Usually Received in 2-5 days. High Standard--- ISO 9001:2000 standard certified manufacturer. High level of Quality!